The Calgary Flames didn’t make the playoffs following a disappointing 2017-18 regular season. Much of the time teams have hefty to-do lists in the off-seasons following a playoff miss, and the Flames are no exception. However, don’t expect Flames general manager Brad Treliving to blow his team up. With the key players in the organization very much still on the up-slope of their careers, keep an eye on Treliving as he toils on a handful of very specific tasks over the spring and summer. If you watch the Flames a lot, you’ll likely notice that Matthew Tkachuk is the emotional heart-and-soul of the club. Still only 20 years old, he has an uncanny ability to get under the skin of opponents and finds a way to get everybody on his side emotionally engaged in whatever game they’re in. While he doesn’t have the offensive upside of Johnny Gaudreau, he’s arguably a more complete three-zone player. The observers that are optimistic about the Flames’ immediate future point to the fact that the Flames have Gaudreau (24), Sean Monahan (23), Mikael Backlund (29), Dougie Hamilton (24), TJ Brodie (27), Travis Hamonic (27) and Michael Stone (27) all locked up through the 2019-20 season – at which point the organization deals with the implications of the Seattle expansion process and re-assesses their club. If Treliving can re-sign Tkachuk to a manageable deal – something resembling Troy Brouwer’s $4.5 million cap hit – he’ll help cement his young core and solidify their window to contend. In his press conference at the Saddledome following player exit interviews, Treliving had a rather stark assessment of his club’s scoring depth: “We relied on too few to do too much.” The team’s top two lines boasted 20+ goal scorers Gaudreau, Monahan, Tkachuk and Micheal Ferland, but then scoring thinned out considerably. The team remains very top-heavy, with only two forward lines and one defensive pairing able to consistently score at even strength. Treliving tried out several different options on the third line in an effort to jump-start the pairing of Sam Bennett and Mark Jankowski. Among those tried were Jaromir Jagr, Garnet Hathaway, Kris Versteeg, Troy Brouwer and Spencer Foo. Foo showed some promise, but in a limited sample size. 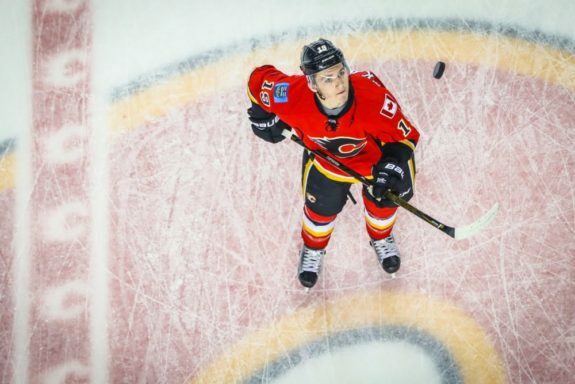 Expect to see Treliving make some moves to add some scoring depth to the team – either adding a bottom-six body, or making a move for a top-six winger to bump some additional scoring down the rotation to the third line. One avenue that’s long been speculated for the Flames to find more scoring is by trading away one of their defensemen. The club was expected to have one of the staunchest defensive groupings in the league after adding Stone and Hamonic last spring and summer and, for various reasons, it just didn’t work out. Hamonic and Brodie never really clicked as a pairing, and moving an established blueliner would allow youngsters like Rasmus Andersson, Oliver Kylington or Juuso Valimaki to push for full-time NHL gigs and to change up the chemistry mix of their entire group. It’s expected that Treliving would prefer to hold onto Giordano – the team’s captain and best all-around blueliner – and Hamonic – their best shutdown defender – but any other moves are probably still in play. Moving a puck-mover like Brodie or Hamilton would allow the team to upgrade their forward group and potentially also land some additional draft picks. That said, it’s likely that the Flames will make changes to their coaching staff between some structural issues on their power play, which was far too reliant on Gaudreau, and some consistency issues with their goaltending in the back half of the season. Given the praise for Gulutzan, it seems more likely that there will be changes to the team’s assistant coaches in an effort to change the mix of voices on the bench, but still retain a head coach that’s a strong philosophical match to the analytically-minded Treliving.